Would you leave your child with a robot? The latest ‘only in Japan’ story is that Japanese mums and dads can now leave their offspring with a friendly robot at the local department store. Ignoring, for now, the obvious questions and concerns this news raises (“Would you leave your child in the care of a robot?”) the technology requires children to wear special badges with QR codes on them that the baby-sitting robot can read to identify each child. 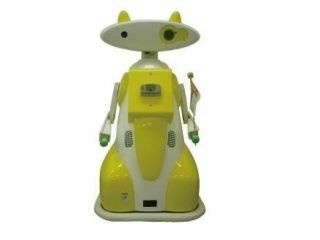 The robot can also chat with the children in its care, though it has a rather limited vocabulary, according to Aeon's publicity [Japanese]. The babysitting robot also contains a digital camera in one eye and a projector in the other, while there's also a publicity-seeking competition to name Tmsuk's metal man.